Many family historians searching parish registers have come across the phrase "buried in woollen" or a reference to "the affidavit". Sometimes another name appears in the register either alongside the actual entry or listed at a later date. This is the name of some person who either laid out the body for burial or viewed the body before the funeral and has sworn that the regulations have been followed. In some registers, there are also entries detailing infringements and the subsequent payment of fines. The decline of the woollen industry on which so many places this country depended brought, in 1678, an Act of Parliament intended to create a new market for woollen cloth. In Parish Registers, from 1678, following the record of the burial, there is an entry "the affidavit brought". 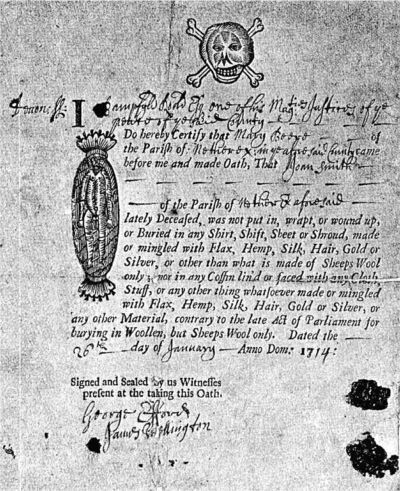 "For the encouragement of of the woollen manufactures of this kingdom and prevention of the exportation of the monies thereof, for the buying and importation of linen. Be it enacted by the King's most excellent Majesty and with the consent of the Lords Spiritual and Temporal, and Commons in this present Parliament assembled, and by the authority thereof, that from and after the five and twentieth day of March in the year of our Lord, one thousand six hundred seventy seven, no person or persons whatever shall be buried in any shirt, shift or sheet made of or mingled with flax, hemp, silk, hair, gold or silver, or other than what shall be made of Wool only, or be put into any coffin lined or faced with anything made of or mingled with flax, hemp, silk or hair; Upon pain of the forfeiture of the sum of five pounds, to be employed to the use of the poor of the parish where such person shall be buried, for or towards providing a stock or work house for the setting them to work, to be levied by the churchwardens and overseers of the poor of such parish or one of them by warrant from any Justice of the Peace, or Mayor, Alderman or Head Officer of such city, town or place-corporate respectively within their several limits by distress and sale of goods of any that had a hand in putting such person into such shift, shirt, sheet or coffin, contrary to this Act, or did order or dispose the doing thereof, to be levied and employed as above said. Provided, that no penalty appointed by this Act, shall be incurred for or by the reason of any person that shall die of the plague, though such person be buried in linen." But it was not easy to carry out this legislation. The wrapping of a corpse in linen is older than Christianity itself, and the old custom could not be broken down by Act of Parliament, and its provisions were easily avoided. In this condition of things, another Act, far more stringent, was passed 12 years later in 1690 and it was enacted that within eight days of the funeral an affidavit of the fact of the burial being in woollen should be brought to the minister, failing which notice should be given to the churchwarden or overseer, who would levy on the defaulting person for the recovery of the fine. This new act was very sweeping, but was not more successful than the former one, and long before its repeal in 1812, it had fallen into disuse.